To ensure you get the correct pen, please identify which one you have. We can’t guarantee that we can supply the exact pen, but we can be sure to give you one which is compatible both with your board, and with your charger. Note also that all eInstruction Interwrite boards (sometimes branded as something else) can be upgraded to the new dualboard capability with a new adapter, charger and pens. The latest pen charger fits the MOBI pens too. It may be a good time to upgrade! Photos may include pictures of chargers, which are sold as separate items to the pens – if you order a pen you don’t get a charger, but if you order a charger you may get pens. Contact us for details. This was probably called “RPEN” when sold with the RM classboards. If you want these, then you need the pen charger II (see below). Requires pen charger II (item E below). 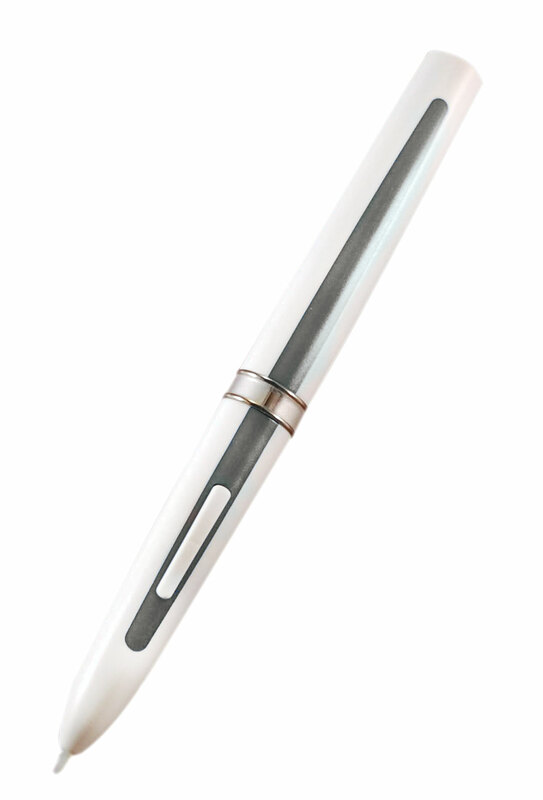 The primary pen is a white pen with grey stripe as of 2013 (see below). For full details of the contents of the pen charger pack, please visit our companion site. Requires pen charger II (item E above). IMPORTANT NOTE: If you want a second/ spare pen for your whiteboard, then you want the Primary pen, not a secondary pen. This secondary pen is for use on a DUALBOARD (that is actually being used as a dualboard) to allow a second student to write on the board at the same time as another student is, using the primary pen. So, two people working on the board at the same time. If you are upgrading from the black pen C then you cannot use this pen unless you also upgrade the electronics of the board (which is not too expensive). This pen may be supplied as a grey body with white stripe as of 2013 (see pen K below). IMPORTANT NOTE: If you want a second/ spare pen for your whiteboard, then you want the Primary pen, not a secondary pen. This secondary pen is for use on a DUALBOARD (that is actually being used as a dualboard) to allow a second student to write on the board at the same time as another student is, using the primary pen. So, two people working on the board at the same time. If you are upgrading from the black pen C then you cannot use this pen unless you also upgrade the electronics of the board (which is not too expensive). Pen not here? We might not have them all. Please send us a photo to info @ banxia.com and we will help you identify it.